Bee Pollen - "most complete food known to man"
Nature's only perfectly complete food is found in the honey bee hive. Pure bee pollen is a natural source of 13 vitamins, 14 minerals and 15 amino acids! It is a regular part of Olympic athletes' diets. The honey bee collects only the best pollen from the most vital part of the plant, mixes it with nectar and carries it back to the hive. There, it is stored and eaten as the primary protein source for the "busy bees". Bee pollen is used worldwide as a daily supplement for energy and good health. It is a natural alternative to help fight allergies, hay fever, hormonal imbalances, and skin problems. Studies have also proven its ability to strengthen the immune system and restrain tumors! In one instance, a track coach fed one half of his team Bee Pollen and the other half none. The portion of the team on Bee Pollen was able to re-energize more quickly and consistently have fast track scores after repeated heats around the course! The other half of the team had times that progressively decreased in speed. (For more detailed information on recent medical and clinical studies, visit our blog at http://beehealthyfarms.blogspot.com). Bee pollen is a concentrated food and is generally taken daily in small amounts. For beginners, 1/8 tsp. per day for the first week, increasing another 1/8 tsp. each week until working up to larger amounts (1 - 2 tsp. or more). Those with high sensitivity or severe allergic discomfort can begin by eating 2 granules at meal time, increasing by 2 at each following meal, until reaching a desired quantity. Bee pollen can be sprinkled on hot or cold cereals, mixed into salads, yogurts, shakes, spread on a sandwich or just eaten plain. 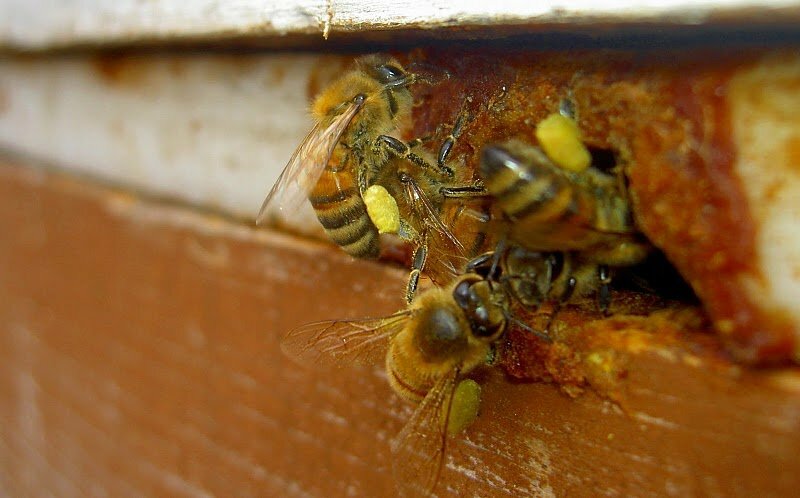 You can even find bee pollen in soaps, shampoos and facial cleansers! The taste and color of bee pollen will vary according to the time of year and location from which it is gathered. Bees collect pollen from a variety of sources, including flowers, orchard fruits and agricultural plants. Fresh pollen will maintain its vitamin strength longer when kept in the freezer and loses its vitality when cooked or heated. Pollen granules in pollen trap.